Batter up – dust off your baseball bat and gloves, the seventh annual Billy Walker Jr. Memorial Softball Tournament will take place Sunday August 27th, 2017. 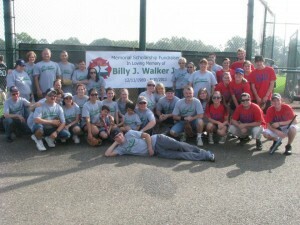 The tournament celebrates Billy Jr.’s legacy with his friends, family and community. We aim to have some fun while raising funds to assist First Responders. When: Sunday August 27th, 2017. 8 am start – double elimination. Where: Laurel Acres Baseball Fields – 1040 Union Mill Road, Mount Laurel, NJ 08054.